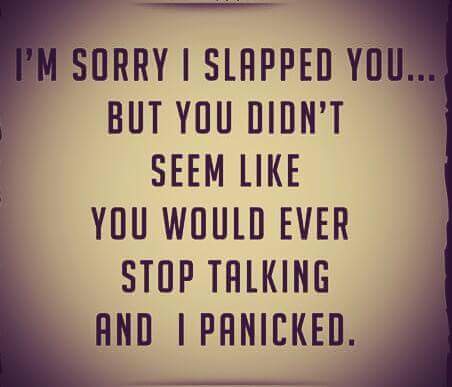 I saw this photo on facebook and decided to save it to my computer for future use. 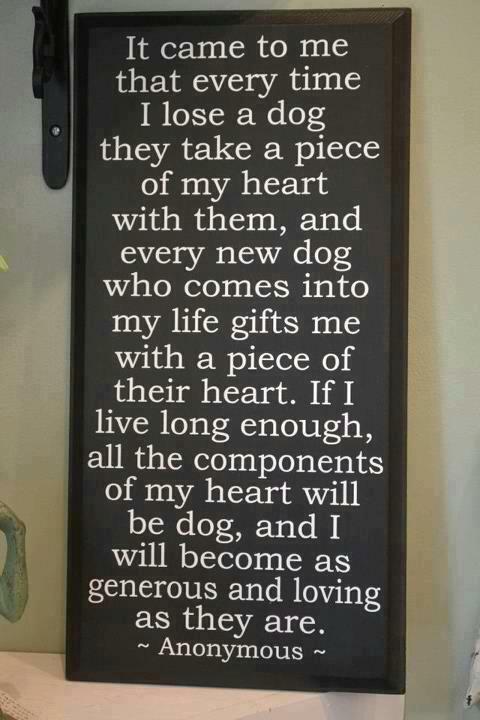 I love the sentiment and have shared it with several friends who have lost dearly loved dogs and cats. 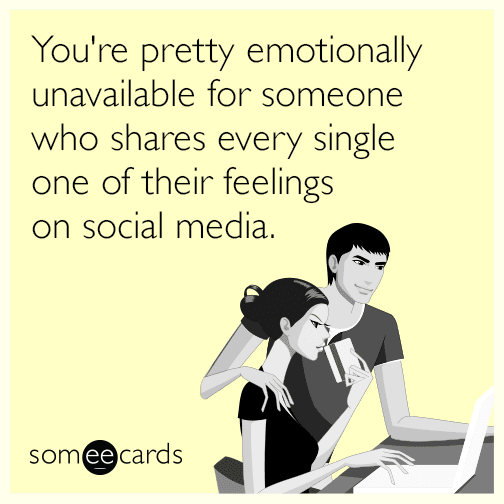 Feel free to do the same. Last week my friend Susan came to town to take care of a business matter. Susan is the reason why we live in this great little seaside village. Back in the late '90s when Susan and I worked for the same company and became friends, she invited Spouse & me to stay in her little place here. We loved it, so she generously told us to keep the key and use the place anytime, which we did. A few years later we bought that little place from her, then sold it and bought a bigger place, and then eventually moved here full-time some years later. Although we have many shared personality traits and viewpoints, I will always feel like this little village is our chief commonality. After finishing up her business matter, Susan came over to our house and she and Spouse & I sat on the screened porch and talked for a while. It had been a few years since we'd seen each other so there was lots to catch up on. Then we walked a few blocks and had cocktails and appetizers overlooking the water, where I tried to take this 'artsy' photo that unfortunately came out fuzzy. Since the view and weather were so nice we opted to stay and have dinner as well. All 3 of us had wonderful meals which complimented our great conversations and laughter. Then we ended our night together with more conversation on the screened porch. The next morning Spouse went to work and Susan and I had breakfast before she headed home. It was a lovely visit from a lovely friend whom we hope will come again soon. Last Fri I wrote about my friend Joey getting married the next day on the beach, with a reception afterward in a hotel. I thought I'd share some thoughts and photos. First off, outdoor weddings are very risky because you never know how the weather will turn out. It could be cold, rainy, winding, stormy, blazingly hot, crazy humid, or it could be nearly perfect like it was for this wedding. It was in the mid-80s but the humidity was low and there was a lovely, constant breeze. They were very, very lucky. The grooms kindly invited everyone to dress casually (no suits and ties) which made it even more comfortable and enjoyable. After the short and sweet ceremony Spouse & I paused for a moment to take a selfie. The reception was held in the penthouse banquet room of the hotel which provided stunningly beautiful views of the ocean, beach, and boardwalk. The food was served buffet-style and it was really good. The cake came from Charm City Cakes. We don't know if teddy bear Duff Goldman actually made or decorated the cake or not, but it was certainly charming and personalized for the couple. 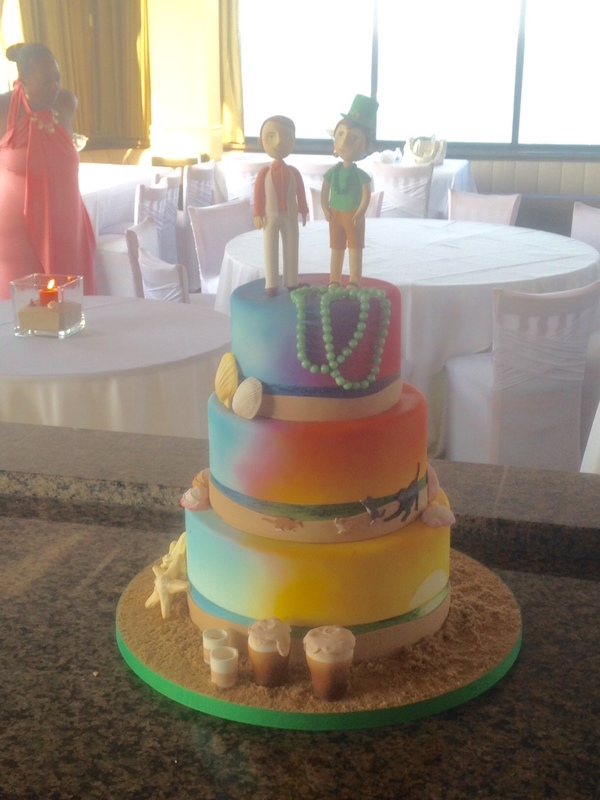 The groom on the left side of the cake is 'dressed' in the outfit he wore in the wedding, and the groom on the right is dressed in a St Patrick's outfit because they met at a St Patrick's day party. Its difficult to see in this photo but their dog and 3 cats are represented on the middle tier, as well as beer stines, sea shells, and starfish. After a few toasts from the 2 maids of honor, the grooms posed for photos and had their first dance as a married couple. They wore matching ivory colored vests made from 1 of the grooms' mother's wedding gown, and they got married on the other groom's mother's birthday. Then the DJ pumped up the tempo and the dancing began. Even Joey's 92 year old aunt joined in and had a dance with both grooms! Everyone seemed to have a great time, including Spouse who always imagines the worst in such social situations. Naturally witnessing the love and contentment of this couple brought back memories of mine and Spouse's wedding, which was probably one of the best times of my life. Walter - his nickname is "Little One", although he is now taller and longer than Marvin. Walter turned 1 year old on Mon. After doing a little reading on when to transition from puppy food to adult food I made the decision to start it last week. I began by mixing a sprinkle of adult food in with his puppy food. Over a week's time I gradually adjusted the blend of puppy food and adult food so that on the last day it was just a sprinkle of puppy food. Now both Marvin & Walter both eat the same food which is more convenient for us. But its also a reminder that our "Little One" is growing up. Weight loss - its been several weeks since I've written anything on this topic, mostly because I've still not reached my goal weight. For over a month now I've been at or near the same weight, which has been disappointing. Spouse says that's because its the weight I'm supposed to be, but I believe its because I've been 'cheating' just enough to stay at the same weight. I'm going to a wedding tomorrow night, but after that I'm going to eat clean and hopefully lose the last 4 lbs to meet my goal weight. Weeds - early this spring Spouse & I spent an hour or so pulling weeds and grass from the beds that line our front porch and the sidewalk to the street. It was enough at the time, but with the full onset of summer the weeds and grass came back with a vengence. In addition to the beds that line our front porch and the sidewalk to the street, the beds along the driveway, side of the garage, and the side entrance to the house were starting to look like Jurassic Park. I decided this was just too much work for 2 lazy, 50+ year old men (1 with bad knees) so I hired a teenager to do it for us. He said he was saving money to go to wrestling camp, so I asked him how much the camp cost. Rather than paying him the agreed upon amount, I paid him the cost of the camp. He was absolutely thrilled and so was I. Surely that money meant more to him that it did to me. Wedding - tomorrow Spouse & I are going to our very 1st beach wedding. My good friend Joey is getting married on the beach and then having the reception in a hotel. Planning a beach wedding in late July is rather risky. It could be super hot, super humid, or even worse - stormy. Lucky for them the forecast is great so it should be lovely. I'm looking forward to my 1st beach wedding! 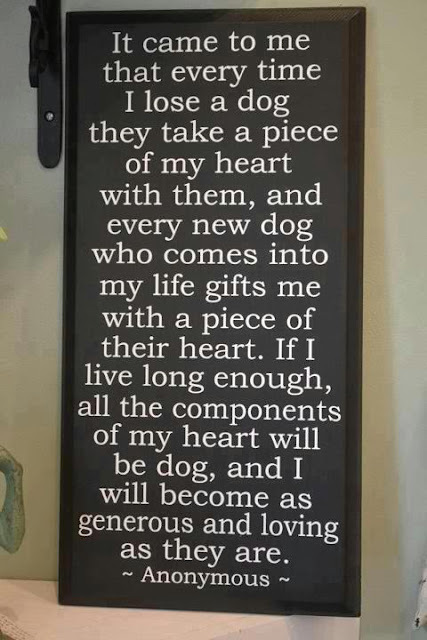 I've saved this graphic to my computer and will email it or post it on my friends' facebook walls when they lose a 4-legged family member. I just love it! Today is Spouse's birthday and Walter's birthday! I planned a surprise birthday dinner for Spouse yesterday at 1 of his favorite restaurants: Dos Locos. The owners are also friends of ours and always ensure that we are well taken car of when we're there. Spouse thought we were just meeting Steven & Thad for dinner, but when we arrived he found our friends Joe P, Bryan, and Thatcher there too. Bryan brought mylar birthday balloons for an added special touch. We had cocktails, chips and salsa and queso, and eventually ordered dinner. We talked and laughed and enjoyed the time together. Then they brought out the huge sombrero and birthday cake I'd ordered and everyone sang 'happy birthday'. It was a very nice evening. When we got home I gave him some early birthday gifts; 'early' since his birthday wasn't until today. I had flowers delivered to his office today, his actual birthday. I was hoping the rest of his birthday gifts would arrive today from Zulily.com but they didn't so he'll just have to wait for those. Today is also Walter's birthday, but he seems completely unaware. He's 1 year old. He 'celebrated' by being playful and adorable as usual. I can't imagine where he picked up this slutty pose. Thanks to MAC at Yummy of the Day for this delicious-looking dude! Spouse sometimes brings magazines home from his trainer visits. 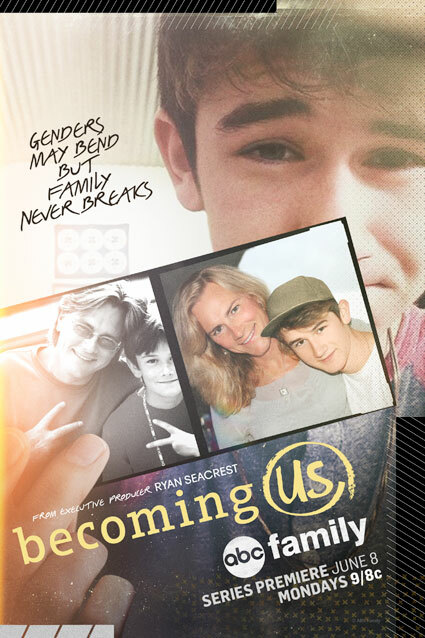 As I flipped through OUT or Advocate (I can't remember which) I saw an ad for a TV show called "Becoming Us" on the ABC Family channel, with the tagline "Gender may bend but family never breaks"
I made a mental note of the show's title so I could look for it on demand. That night there was nothing good to watch on regular TV so I popped over to the on demand menu and found "Becoming Us". I watched 2 episodes that night, and the remaining 3 episodes last night. Its a documentary-style show about 16-year old Ben, his older sister Sutton, and his parents Suzy and Carly who are divorced. Carly is a trans woman who used to be Charlie, Ben's dad. By sheer coincidence, Ben has a 17-year old girlfriend Danielle whose father Dan is also transitioning. Also in the show are Ben's best friend Ayton, his girlfriend Brook, and her brother Lathan. This show isn't really about being a trans person. It deals with typical family issues like Ben not applying himself in school and Sutton's engagement and upcoming wedding, but also includes the family members' varying reactions and relationships with the trans people in their family. Its kind of like the way "Modern Family" isn't about a gay couple with a young daughter, although it includes them in a very integrated way. This is a documentary-style show, not a scripted one, so things don't always work out in the end, but I find it very interesting to have a look into the lives of a family with a transgender parent. If your cable provider offers ABC Family, you can watch the 5 episodes shown so far on demand or on your computer at their website. New episodes air on Mon nights. Let me know if you've seen this and what you think of it. Since I'm a Realtor, I normally work on Saturdays and sometimes on Sundays too. Since I'm a member of a team and we rotate our office coverage, it is possible for me to have a full weekend off now and then. Most of these off weekends are scheduled for specific events though, such as weekend visits with family and friends. So, it was a pretty rare occasion for me to be scheduled off both days, have no client appointments, and have no family or friends visits this past weekend. Spouse & I decided we would tackle a couple of home projects as well as have some fun this weekend. Sat morning we met up with Steven & Thad for breakfast, then came home a pulled the power washer out. Our front porch, sidewalk, and lamp post were in real need of cleaning, as they tend to get grey mildew on the undersides where the sun doesn't reach. Power washing really gets that grey mildew off! We also power washed the 4 white rocking chairs and 2 small tables that occupy the front porch. The results were amazing! Then we moved around to the side of the house where the other driveway and side entrance to the house is located. We power washed the side entryway, back exterior wall of the garage, and the sidewalk to remove some green algae. It took about 3 hours from start to finish. 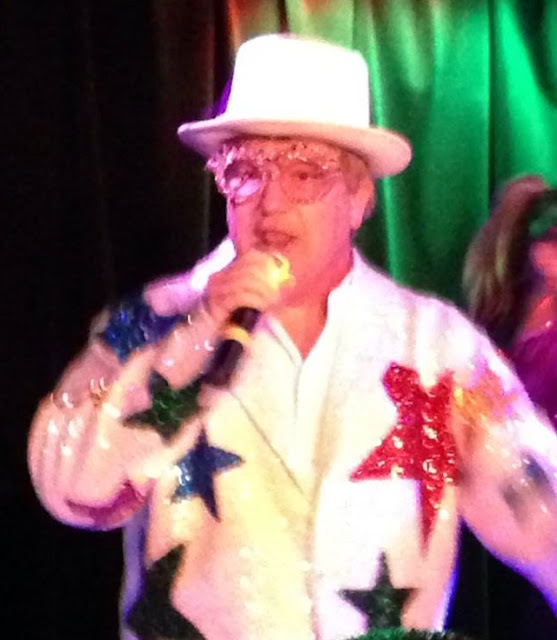 After showering and relaxing for a little while, we met up with Steven & Thad, Joe P, and Betsy & Bob for dinner at Dos Locos, and then I walked over to the Blue Moon to get ready for my performance as Elton John in the Legends show. The audience was really 'into' the show and many were singing along with me, which was really fun! Immediately after the show the Legends mix and mingle with the audience for a little while, and I was asked to pose for photos with several customers. It was great! Sun morning Spouse & I picked up Steven & Thad in Big Ella and drove to a small car show in Ocean City, MD. We had breakfast, looked at the cars, and then headed back home. It was a nice weather for the drive. Then Spouse & I moved the dining table and chairs out of the dining room so we could shampoo the dining room rug. That went pretty quickly, and while the rug dried Spouse took a nap and I watched TV with Marvin & Walter at my side. That evening we decided to have a picnic dinner at the beach. We met Steven & Thad at 6:00 and shared cheesesteaks, potato chips, fries, and drinks. (Yes, I went off my eating plan but it was worth it.) It was a gorgeous evening and we stayed until 8:30. I really enjoy it when we have a fun and productive weekend. 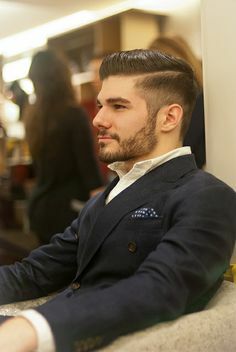 I saw a video on facebook entitled "100 years of men's fashion in 3 minutes" that I thought was quite interesting. Unfortunately its not on YouTube so I couldn't embed the video here, so you'll just have to click on this link to watch it. The guy has a really nice body, which is a bonus in between the decades of looks. They also did "100 years of women's fashion in 3 minutes" which I found far less interesting, but you can also watch that here. 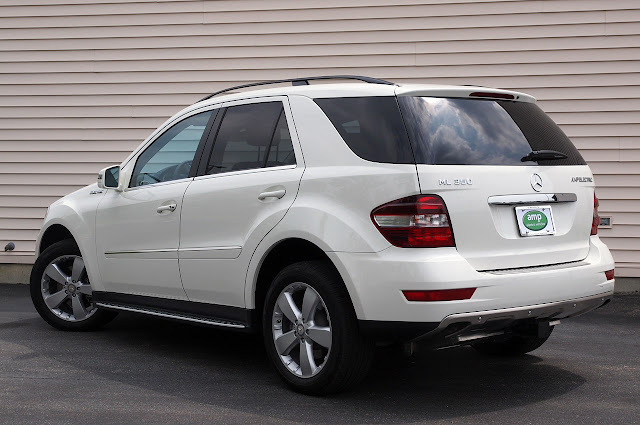 So yesterday I called our insurance carrier to remove the '06 Chrysler PT Cruiser from our policy and add the '10 Mercedes Benz ML350 to our policy. It was pretty easy since I had the new vehicle's VIN handy and wanted exactly the same coverage. The agent said our premium would go DOWN by $6. "How could this be possible?" I asked. "The Kelly Blue Book value of the new car is literally 10 times the value of the old car!" As the agent explained, premiums are calculated in part by the frequency of claims submitted by make and model. Apparently there are a lot more claims filed by PT Cruiser owners than by ML350 owners. Still, from a replacement value point of view it seemed impossible that our rate would go down by replacing a cheap car with a more expensive one, but the agent double-checked her calculations and confirmed the lower rate. I was totally floored but accepted the rate reduction. Since Sat was the 4th of July, I got to drive Big Ella in the Doo Dah parade! This is always fun for a couple reasons. 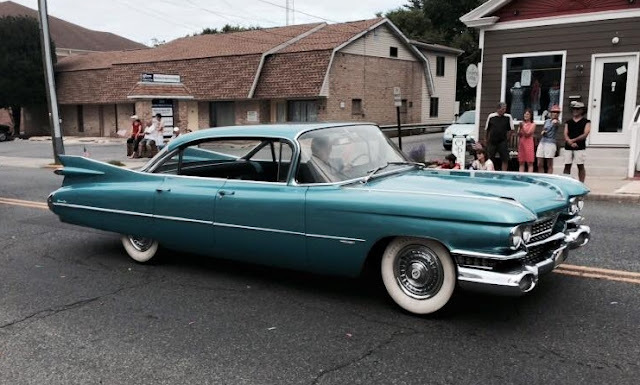 I love driving Big Ella, people love to look at Big Ella, and she is just a great example of American auto production, and Independence Day celebrates America. Steve & Thad came over to watch the parade with Spouse, and then the 4 of us had dinner on the screened porch. Spouse made bacon-wrapped filets, homemade macaroni and cheese, and a broccoli slaw. For dessert he made a strawberry blueberry peach pie. Later that evening I slipped away from the group to go perform in the Legends show. Spouse is picking up his new car today: a 2010 Mercedes Benz ML350. As I mentioned in this post, we've been looking for a new car for him for over a month. Our friend Bryan owns a great used car dealership and has gotten us great cars in the past, so we told him what we were looking for. 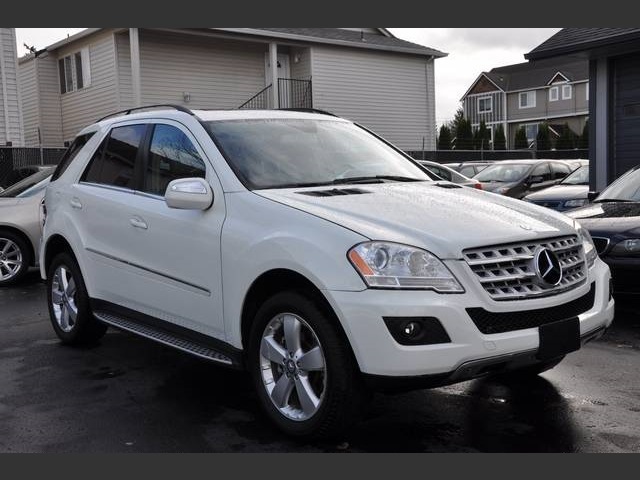 He found a 2007 ML350 but after having it evaluated by his mechanic he found it had a 'soft cam' issue which is documented on the internet for this year/model, so it was returned. A few weeks later he found a 2008 ML500 (same body with a larger engine) but after evaluation by his mechanic this vehicle had a transmission issue, so it was returned too. 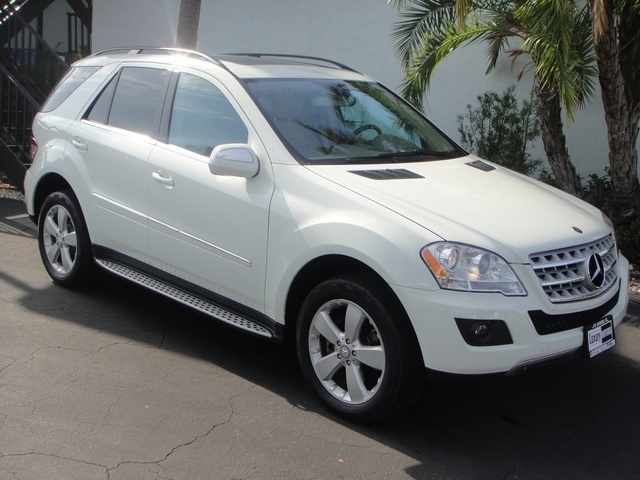 Finally Bryan was able to get us this 2010 ML350 which has been checked out and given a clean bill of health. 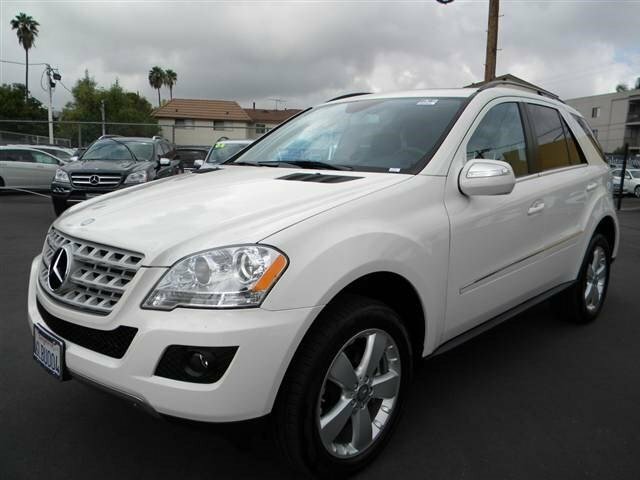 This color combination is Spouse's favorite: creamy white exterior with tan interior. I've made Spouse promise to keep this new car cleaner than his old PT Cruiser, which means no food, candy, or gum wrappers AND regular washing and vacuuming.